To ensure that your contract is submitted properly, please take ONE MINUTE to review these important instructions. Once you receive your contract email from housing you will be ready to proceed. If you have questions at any time, please refer back to this page for assistance. Note: We strongly encourage you to use a large-screen devices (not a smartphone) to review your contract. The contract is not formatted for mobile display. How do I view my contract? Look for the image of the key. 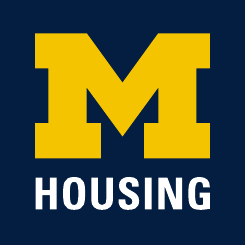 Using the link at the end of this page, enter the system, scroll down to "Academic Year Housing 2018-2019" and click on "Meal Plan Selection and Housing Contract". How do I proceed past the meal plan selection page? In order to view your contract, you must choose a meal plan because the cost of the meal plan you select is added to the contract. You may go back and change your selection before submitting your contract. If you decide after submitting the contract that you would like a different meal plan, you can select a different plan online at the beginning of fall term. How do I know when I have submitted the contract? When your contract is ready for your review, you will receive an email to your U-M email account. If you have already received this email, you can review and submit your contract.